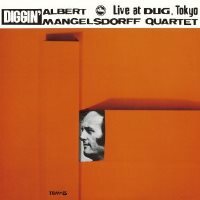 Diggin' by the Albert Mangelsdorff Quartet is an exciting live album recorded at a legendary jazz club called "Dug" in Tokyo in 1971. The regular quartet at the time consisited of Heinz Sauer on tenor sax, Gunter Lenz on bass and Ralf Hubner on drums, and of course the leader Albert Mangelsdorff on trombone. According to the Japanese liner notes this recording was suggested by Horst Weber (of Enja Records) who had known Mangelsdorff for a long time and was particularly impressed by the group he was leading at the time. The recording, which took place two weeks later, was spontaneous and unrehearsed. They didn't even have a set list and decided what to play on the stage, and one tune, "Mahusale" was completely improvised. Members were all very excited to be there and clearly inspired. The performances are incredibly powerful and expressive. The brilliant sound engineered by the great Yoshihiko Kannari is open and vivid, adding value to this superb album. This reissue CD includes a bonus track (Boston Highway) which was not included in the original LP. Recommended for fans of Mangelsdorff and free jazz! Produced by Takeshi Fujii. Recorded live at Dug, Tokyo, on February 15, 1971 by Yoshihiko Kannnari. Blu-spec CD is compatible with all regular CD players. Paper sleeve special limited edition.